Did early Mars have a vast northern ocean? 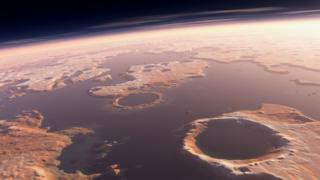 Scientists have located an impact crater linked to powerful tsunamis that swept across part of ancient Mars. Lomonosov crater in the planet’s northern plains fits the bill as the source of tsunami deposits identified on the surface. Details were outlined at the 48th Lunar and Planetary Science Conference. Although the idea has lost some of its currency in recent years, some scientists think an ocean might once have filled the vast lowland region that occupies the Red Planet’s northerly latitudes. Growing evidence that tsunami waves washed over the boundary between the southern highlands and northern lowlands help strengthen the hypothesis. François Costard, Steve Clifford and colleagues identified and mapped the distribution of sediment that apparently originated in the northern plains and flowed onto a possible ancient shoreline to the south. “We found typical tsunami deposits along the dichotomy between the northern hemisphere and southern hemisphere of Mars,” Dr Costard, from Université Paris-Sud and CNRS, told BBC News. One type of feature seen on the dichotomy boundary is a lobate flow deposit. Dr Clifford, from the Lunar and Planetary Institute in Houston, explained the evidence. “These lobate deposits propagate uphill from the northern plains and do so in close association with a potential palaeo-shoreline. The predictions of the numerical modelling that François and his colleagues have done provide a very persuasive case for an ocean at this time,” he told BBC News. The proposed Martian tsunami travelled 150km (95 miles) inland, climbing to elevations of about 100m (330ft). “If we do have this evidence of a tsunami having occurred back three billion years ago, there must have been an ocean present in the northern plains,” said Steve Clifford. The researchers have identified what they think is the best candidate for the impact crater, a 120km-wide bowl called Lomonosov, after the 18th Century Russian polymath Mikhail Vasilyevich Lomonosov. The feature is extremely degraded today, with a collapsed crater rim. Two successive waves were formed during the event, says François Costard. “It was a really large-scale, high speed tsunami. At the very beginning, a crater of 70km in diameter was created by the impact. This expelled a huge volume of water, with wave propagation at 60m/second,” he explained. This gigantic wave washed over hills and plateaus and through valleys, leaving behind the lobate flow deposits. “Finally… due to the Martian ocean filling in that crater, which produced a kind of rebound, there was a second wave propagation,” Dr Costard added. If there was an ocean on Mars three billion years ago, it could have made the Red Planet a more hospitable place for life, raising hopes that signs of biology could be detected today. “It’s very hard to conceive of any other process other than a tsunami that could have emplaced these lobate deposits along the dichotomy boundary,” Steve Clifford told BBC News. While a few other teams have reported evidence of tsunamis on Mars, no one up until now has linked the events to particular impact crater. The research has been published in the Journal of Geophysical Research – Planets.